Quick companion piece to Friday's Pops post and a crucial chunk in that all important Photosynthesis-era renaissance of the early 00s, Rob Pluhowski. Love that bottom 360 flip. One of my favorite interviews, Habitat has never been the same without this dude and Danny Renaud. ONe of the all-time Faves. He was just so...Every ad/footage/bit made you wanna skate, shred Indys, buy Sect boards and even Nikeys for Chrissake !! He was on Element for a minute too, when they were kicking arse. Guess him too had bad sides and great sides, ha ha ! I mean, yeah, according to me....he did his job alright. Long live Rob. Love you Rob. I always really liked Rob's style and trick selection. Bummed that he quit the pro (or was he Am?) ranks. Hope he's doing well in whatever he's doing. This all reminds me of how I LOVED the photosynthesis era. Wenning and Pops came in and crushed the scene, Kalis had such a super ill part, Dill, AVE . . . the list could go on. 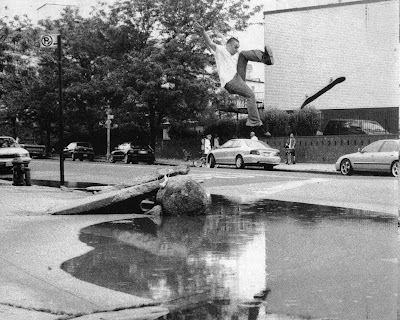 Two big things about that era stand out for me: pop out mid-ledge became the "it" thing; and Dill walking down those steps for that huge ollie was widely accepted as being awesome (not debating that point, but it seemed like it was the talk for a while). How about a Jesus Fernandez, Stevie or TX post? All would be timely in light of recent video releases.